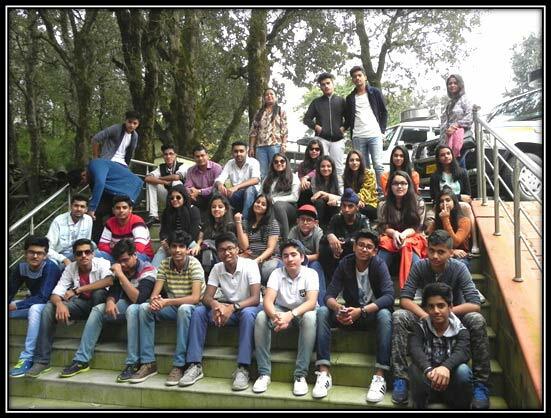 On 4th/oct/2017 evening at 9:00 p.m, the students of IX -XII going for the trip gathered at the School Campus for their trip. They boarded the bus at 10:00 p.m and started their trip for Nainital and Jim Corbett. * The students were first taken to the ARIES Observatory in Nainital, they were shown the giant telescope and given information on its working, they were also taken to the Planetorium where they were shown and later explained on how the celestial bodies are formed. * Next on the Itinerary was the Eco Cave Garden where the students enjoyed exploring the caves. * Post lunch, the group headed for the Nainital Market for marketing. Day 2 (6/10/17) – In the morning, the students had their breakfast and boarded the vehicle for Jim Corbett National park. * On the way, they visited Jim Corbett Museum and Jim Corbett Falls. * At 2:30 p.m, we reached the hotel and headed for lunch. * They had their dinner after the session and then called it a day. Day 3 (7/10/17) – The students started their day with jungle safari. They returned back and had their breakfast, spent some quality time with each other till lunch, after lunch a bunch of activity was planned out for them which included Rocket Jumping, putting the loop into the pole, cricket etc. In the evening after snacks, they viewed the Saturn and few more celestial bodies. Later in the evening , they danced to the tune of Punjabi music. They had their dinner and finally retired for the day.